Buss Erk is using a new SENNEBOGEN 8130 EQ balance material handler in Iskenderun port to handle tonnes of fertilizer. The machine is powered by an 160kW electric motor and has a maximum reach of 30m. A new balance material handler, the SENNEBOGEN 8160 EQ, unloads arriving ships in Iskenderun Turkey. The machine saves up to 75% on operating costs thanks to a sophisticated balance principle and electric drive. The Hamburg Buss Group, established as a stowage since 1920, is now a reliable partner in matters of port logistics and shipping services worldwide. Buss Erk, a subsidiary company, is handling around two million tonnes of mass and general cargo in LimakPort Turkey annually. 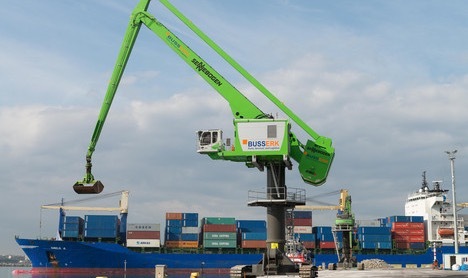 The reliable material handlers from SENNEBOGEN have been used for years in the loading and unloading of the ships up to approx. 30,000 DWT. A balance material handler with a reach of 30 m and an electric drive that come with the new SENNEBOGEN 8160 EQ, delivered by the Turkish sales and service partner Forsen mid 2016, is used for the first time. The efficiency principle of the EQ machines has long been proven, the principle of the lever has been in use for centuries, and now even large reaches in demanding handling situations are ideally catered for thanks to the SENNEBOGEN balance material handlers. Thanks to the equipment's 30-meter-long reach, the machine not only comfortably covers a work surface of 2,800 m², but also the ships that require handling can handle cargo deep within the ship's hull with the attached double shell grab. Apart from the high range, the EQ principle is the biggest advantage. Thanks to the consistent balance of the equipment and environment-friendly electric drive, up to 75 % of the operating costs can be saved. The 8160 EQ is powered by a 160 kW electric motor. The machine is connected to the power supply via the cable drum mounted on the crawler undercarriage and, at the same time, can still be driven flexibly along the quays. The 8160 is configured with a 6.5 m pipe-pylon between the upper carriage and undercarriage in order to reach the necessary reach depth into the ship's interior up to a maximum of minus 12 m and to be able to work comfortably over the ship's walls. The driver has an unobstructed view of the work area from the Maxcab industrial cab, protruding forwards. The window positioned at the bottom and additional surrounding cameras complete the all-round view.